If the old Main Street church in Albany is going to be moved, it might go to one of three possible city-owned sites, members of Mayor Sharon Konopa’s work group on “historic properties” have suggested. 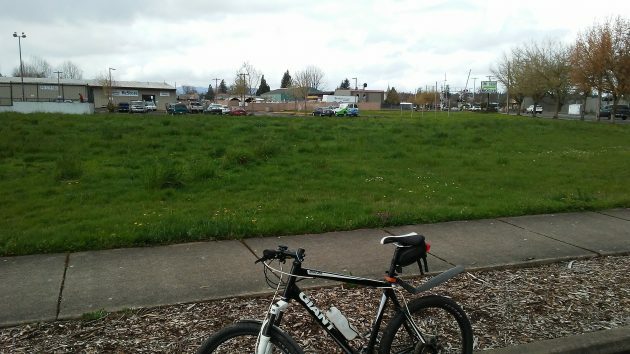 Judging by the panel’s discussion Monday, the leading site is a weedy parcel at Pine Street and Santiam Road, near the city’s skatepark. The others are a vacant lot the city obtained a few years ago from the BNSF railroad inside what is to become the Edgewater Village development, and a corner of Swanson Park at Sixth Avenue and Jackson Street. The skatepark site is just two-tenths of a mile from the former Cumberland (Grace) Presbyterian Church at Main Street and Santiam. The city bought the church in 2000 for $150,000 to make room for a street project but later didn’t need it and has been trying to figure out what to do with it. Parts of the building date from 1892. The center section was added in the 1920s. The building is in poor shape. Fixing it might cost around $300,000, according to one estimate the work group heard, or less depending on its use. One possibility is moving just the original parts of the building and putting them back together at a new site, yielding about 1,200 square feet. 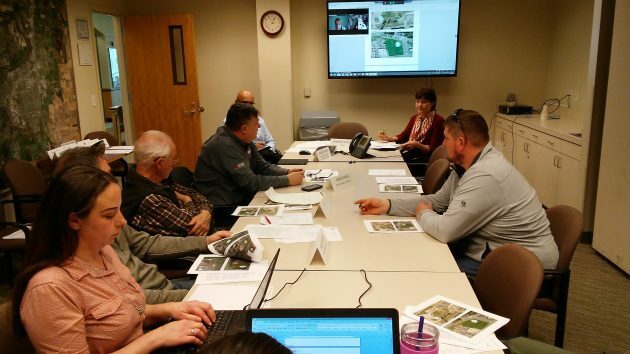 Parks Director Ed Hodney told the work group such a building near the skate park could be used for events and meetings and even serve as a temporary base for parks staff. With additional park improvements there, across the street from Hackleman Park, the old church could be turned into an amenity that would attract “positive activity” to the area. And as a potential rental space, he said, it would be better than the other sites. What about money? Councilman Mike Sykes thought private donors might be tapped to help save the historic church once there’s an actual plan and more is known about the costs. The mayor mentioned CARA, the downtown urban renewal district. The mayor’s work group at work on Monday. 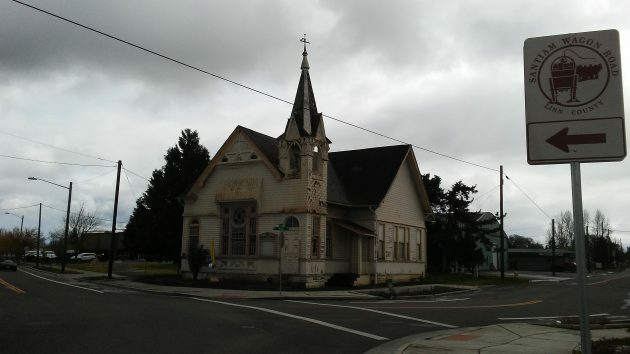 One of the potential sites for the old church at Santiam Road and Pine. Throwing good money after bad. Use the good money to tear it down. How is destroying Albany’s soul good money? This is a total White Elephant! The City screwed up when they bought it and are now trying to make it look like this property actually has some “perceived value”. We know how the scenario goes. More funds will be needed to complete the project due to “unforeseen …..”. How about if the Mayor will be personally responsible for any cost overruns? Total waste when they bought it. Calling it a historic building is a joke by preservation standards. Call in the wrecking crew. Robert, what preservation standards are you using? What are your criteria for calling it a joke? What period of significance do you use for your preservation standards? Please explain the error of the City of Albany listing this in the Local Historic Inventory. “Calling it a historic building is a joke…”?! Wow, kinda cold, dude. If a building dating back to 1892 isn’t historic, then what is? I’m glad not everyone in Albany shares your opinion, or our four historic districts would be a pale shadow of what they are. Zero argument that the structure is “historic”. It should be preserved. Moved? Ironic that the lot screams “starbucks”. Sigh!